This is the third installment of the “Getting Mad at Your Heroes” series (Parts one and two here and here.) Like I promised, this edition if brought to you by a guest writer – the wonderful, talented, funny, one and only, Ryan Reaves. Earlier this year he was writing a sports column for the newspaper, so I asked him to tackle (heh, see what I did there?) the sports edition of this series. As a FSU alum, I balked when he said he wanted to write about the gators on MY blog, but after reading his piece, I’m glad I conceded. But back off ladies – he’s taken. Walking into Ben Hill Griffin Stadium on an early July evening can be a pretty surreal experience for anyone who watches college football or breathes. Emily, her sister Stephanie and I made our way through the one gate left open for visitors and students who stayed in Gainesville for summer classes. Being the only Florida fan of us three, I gave somewhat of a grand tour of the place when we walked into the empty stadium. Now I’ve been to this place plenty of times and seen both epic showdowns and routine cakewalk games, but this was something else. I could smell the fresh-cut grass on the field and hear the echo of footsteps from someone running up the bleachers in the north endzone. It’s strange how my most memorable experience in The Swamp will be the day I walked in when it was empty. No orange and blue face paint. No Tebow chants. No football. No fans. Just silence. While the past five years of Florida football have been the stuff I dreamed of when I was a kid, it’s surprising that it would be the same five years that ruined the experience of being a Gator fan forever. I’m not saying that the level of success we had makes me believe the team is going downhill from here. 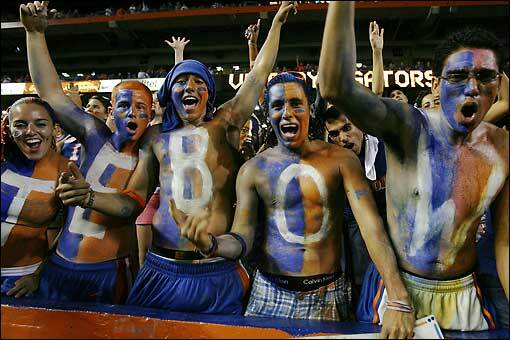 I’m saying the deifying of Tim Tebow coupled with the ever-increasing sense of entitlement has made me lose respect and camaraderie I had for Gator fans. Don’t get me wrong. Tim Tebow is the greatest player to put on an orange helmet and is arguably among college football’s greatest athletes. I even got the chance to meet him shortly after he won the Heisman and based on my encounter, he’s even a better person off the field. But why did we have to turn the future fourth string Denver Bronco into Superman? Why carve poorly-rendered wooden statues of him in our backyard bbq? Why put him in Jockey commercials awkwardly telling us we “got to feel this shirt”? What the average person sees as just another football player, Gator fans see as a clean-cut domesticated All-American Jesus, wearing a grass-stained blue jersey and sporting John 3:16 on his eye blacks. The media saw how the fans worshipped Tebow and got the phenomenon bandwagon going. Now struggling in Denver, fans and media are SHOCKED at the fact that the once invincible Tebow is now vulnerable and human. What is it about us that makes us put so much pressure on people? Are we so desperate for some kind of “real” savior that we’ll idolize almost anyone? To many, Tim Tebow is the only Jesus they’ll believe in. The thing about people, teams, organizations, movements, etc. is that when we put too much stock in them, they’ll eventually and inevitably let us down. That’s why God warns us against idols. It’s good to be a part of something bigger than yourself; whether you’re a fan, a teammate, a member, a citizen or a follower. But we have to be careful with how much of our identity we put into something that’s manmade. Looking at the world through team-colored glasses can blind us from seeing the whole picture and sometimes the truth. The same is true in things like politics. If most of your identity lies in your political beliefs, then objectivity becomes a challenge if not impossible. Until we see our identities for what they truly are, we’ll never be free. As someone who’s struggled with finding their identity, I can vouch for this. Learning that I am both worse than I could possibly imagine while being loved more than I could hope for has been the foundation of my new identity.